Purchase a book to support Safe Connections in November or December 2014. While Dr. Kelly York is an expert at identifying other people’s character, she struggles with her own. Her pursuit to understand a killer uncovers more than murder. You can support Safe Connections and find out more about the intriguing Dr. York by purchasing the suspense thriller titled, Horoscope: The Astrology Murders written by Georgia Frontiere before her passing in 2008. 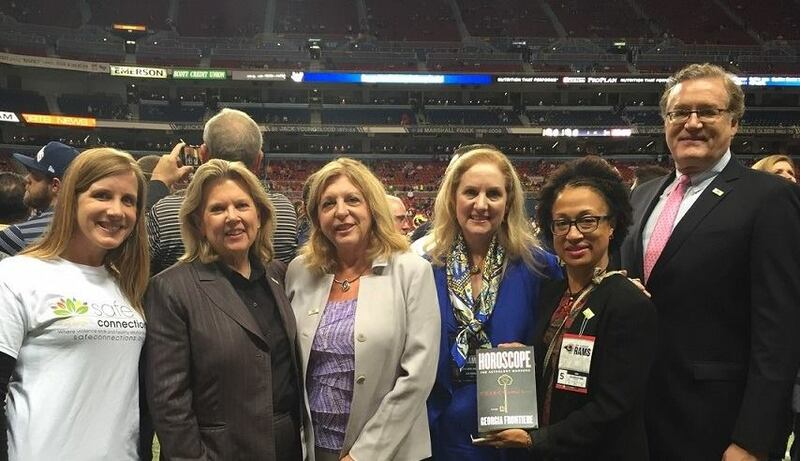 The family of the late Georgia Frontiere, former St. Louis Rams owner, chose to take a public stand on domestic violence by partnering with Safe Connections. The partnership was the brainchild of Lucia Rodriguez, Ms. Frontier’s daughter. Ms. Rodriguez wanted to help a St. Louis-based nonprofit while celebrating the launch of her mother’s book. “My mother’s book explores themes of both domestic violence and sexual assault. Safe Connections is the perfect fit for celebrating the book and drawing attention to how domestic and sexual violence affect all of us,” said Ms. Rodgriguez. The book is available online, at local bookstores and during Rams games. A portion of the book’s proceeds in November and December will benefit Safe Connections. As part of Domestic Violence Awareness month, the Frontiere family and Safe Connections held a private book launch party for supporters, friends and family at STL books on Oct. 8, 2014. Copies were signed by Ms. Rodriguez, who with her brother, helped make the book publication possible. As another aspect of the partnership, Safe Connections staff and board members joined Ms. Rodriguez for Monday Night Ram’s Football at the Edward Jones Dome on October 13. The group enjoyed pre-game on-field exposure and a great photo opportunity. View photos from the private book launch in the Ladue News and read coverage of event covered by Town and Style.